The Urban Intervention Camp (UIC) was a series of events looking at the uses of public spaces in Lido, Venice that took place over three days during the opening week of this year’s Biennale. The focus of the UIC was to work with a variety of local groups, such as city officials, immigrants, activists, artists, and designers, and look at the abandoned site of Ospedale al Mare – a public hospital left in ruins for over ten years and then sold by the city for the eventual construction of luxury housing. In the desolate former hospital complex, mostly quietly abandoned, activist groups have occupied and reinvigorated this single room. 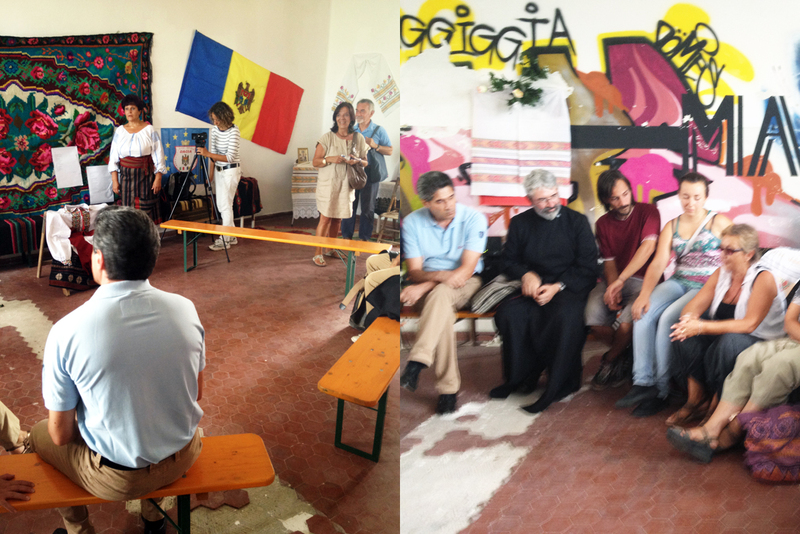 Discussions were held here with the Badanti, who were presented the space to be used as a temporary cultural center. CWZW – Discolè: What were trying to communicate (or implement), in the context of the Venice architecture biennale, with ‘Urban Intervention Camp’ ? QR: The UIC is a collective research project about the rules and uses of public space in Lido by architects and designers from the U.S. and Italy. We wanted to take the themes of the biennale,Common Ground, and the U.S. Pavilion, Spontaneous Interventions, and think about what those two terms mean in the Venetian context. To do this we created a large group of local groups that had a stake in a singular site: Ospedale al Mare in Lido. Ospedale al Mare is an abandoned hospital currently in ruins. 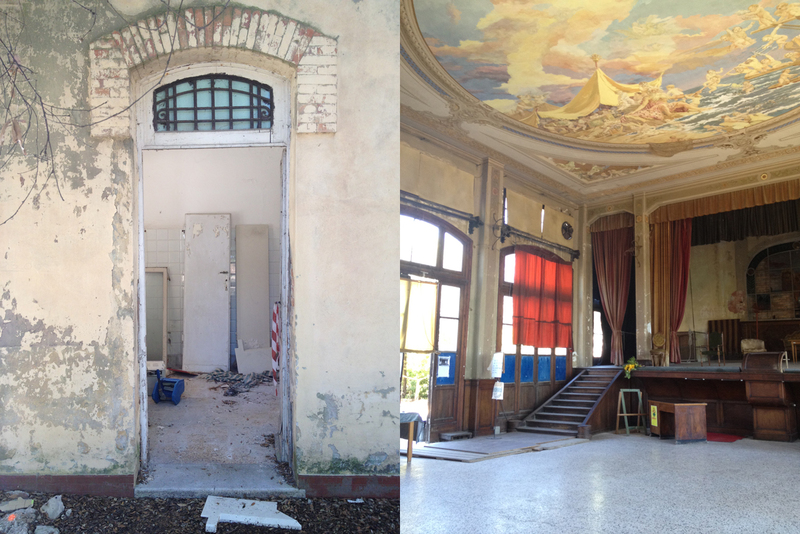 Tired of the neglect, a group of young Venetians have occupied and restored Teatro Marinoni, a theater building within the hospital complex, for over a year. We created events and workshops with the goal to understand how a public hospital with the mission to serve the poorest populations had been left to deteriorate and was eventually sold to developers for the construction of luxury housing. In the workshops, we also took some of the things we learned to design small interventions. These interventions used materials found in the ruins of Ospedale al Mare to create small objects that after understanding the needs of the team occupying Teatro Marinoni. 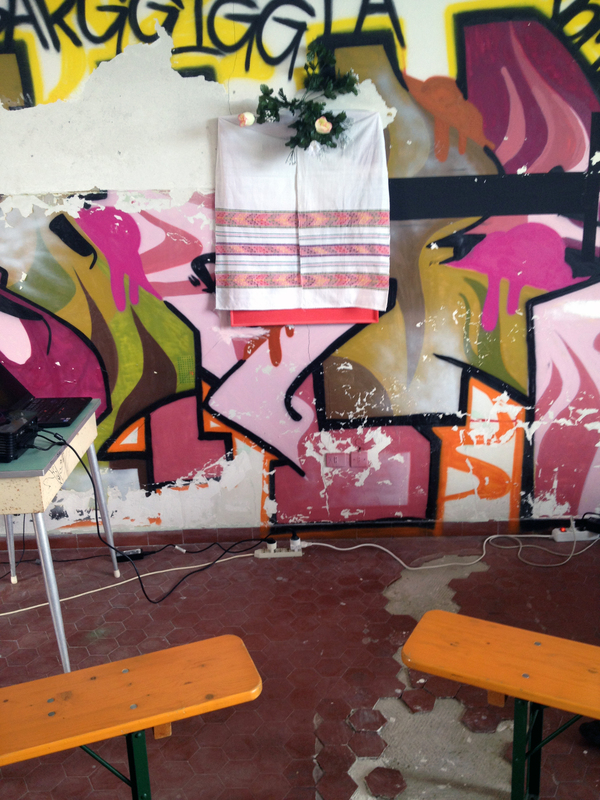 CWZW – Discolè:Urban Intervention Camp is posed as a 3-day event. How do you envision and/or intend for the project to have a further, longer-term reach? QR: The UIC was designed as the beginning of a much larger commitment to Lido and Venice. To fulfill this goal it was key to have local partners that could take the lead in the continuing project. After all, local designers, activists and community members know much better what interventions are needed than a group visiting from the U.S. In what was perhaps the greatest result of the UIC, we were able to bring together a group of interested parties that reside in Venice. We brought together public officials, academics, immigrant groups, activists and local designers to discuss the events that led to the loss of Ospedale al Mare as public space and to begin to think about future interventions that may help create new areas for common use in Lido. This group will continue to meet and together decide what their next steps are. The team from the U.S. will also stay involved, sharing skills and experiences working in similar processes. CWZW – Discolè: International exhibitions such as the Venice Biennale can be critiqued as lofty and bourgeois, as not fully accessible to the general public, as having a curated audience. You yourself also confronted difficulties acquiring admission for everyone involved on your project. What are your thoughts on this critique? QR: Yes, the U.S. pavilion staff had a hard time getting the passes needed for the Italian guests from the Biennale bureaucracy. After a lot of hard work and negotiations we were eventually able to secure entry for the entire group. To us it was important to finish the UIC at the Biennale because, as I said before, we thought that we were seriously discussing their theme – we were interested in questioning, discussing and creating common ground. To be sure it was frustrating, but perhaps it is part of growing pains for these types of international exhibitions as they seek to tackle real social conditions. These themes elicit work that moves beyond institutional walls and take critical and targeted action. CWZW – Discolè: Given that your work is a form of political activism, how did this project create an ironic relationship with the Venice Biennale and the U.S. Pavilion? How did your practice and this specific project seek to negotiate this challenge? QR: Perhaps one of the most interesting pieces we learned was that the public hospital in Lido was sold to build a new large Film Palace for the Biennale. I am not sure we were looking to create irony, but it seems like irony is inevitable when you simply dig a little deeper and take a look at what our institutions say versus what they do. At the end my practice is interested in understanding the complex conditions of current economic models. This usually leads us to look at how populations and their spaces are affected by formal politics and economics. In many ways it is a journalistic project, except we are not simply unbiased bystanders; we want to take action with what we learn. This form of research by narrative leads us to places where contradictions in public policies are clearly seen and thus, there can be action. 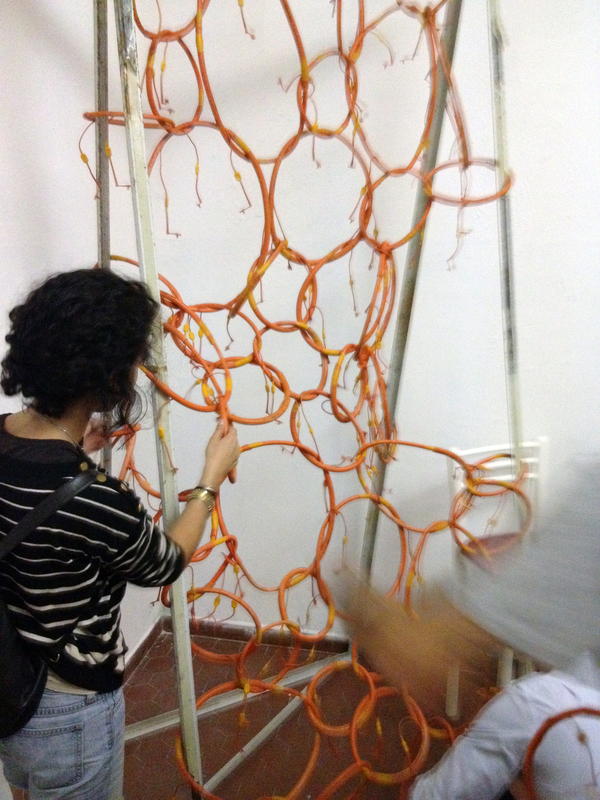 Small construction made with community members in three hours for a room in the Teatro Marinoni — the space was then given to community groups as a meeting space. This quick construction is a community message board and it was built with recovered materials found in the abandoned Ospedale al Mare. 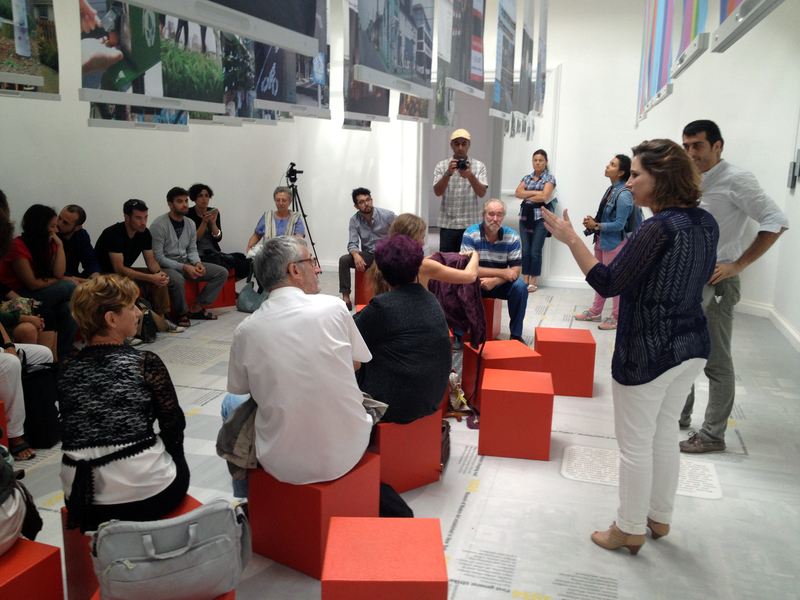 Image from UIC workshop in the Venice Biennale American Pavilion. This workshop brought together members of government, immigrant, activist, academic and design groups to talk about Ospedale al Mare and the role of the commons in Venetian civic life. This conversation will continue, led by community groups and in partnership with similar groups in the U.S. (including DSGN AGNC). The goal is to discuss, advocate for and design new public spaces that are open for use by all local communities and groups in Lido and Venice.